A 36-hour bandh called by the All Koch-Rajbongshi Students’ Union (AKRSU) on Wednesday evoked mixed response in Lakhimpur district on the first day. 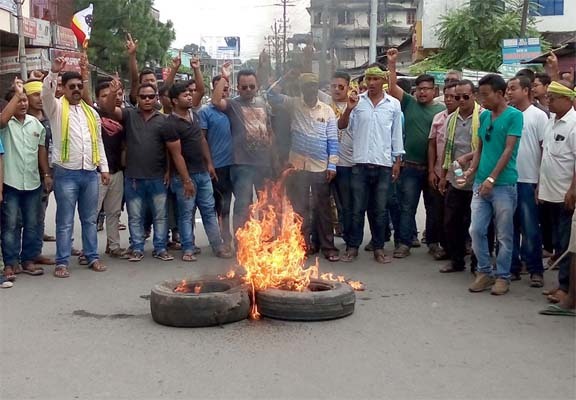 The bandh has been called with a demand to create a separate Kamatapur State and Scheduled Tribe (ST) status for the Koch-Rajbangshi community. The AKRSU bandh failed to get complete response in Lakhimour district as private vehicles ran normally the roads on Wednesday. However, public transport services were hit by the bandh in the district. Though all the schools and colleges were opened on the first day of the bandh, the attendance of students was poor. In North Lakhimpur, the district headquarters, all the Government offices, judiciary and other departments remained open during the bandh period. The bandh paralysed business in the district as entirely all the shops and business establishments remained shut during the bandh period on Wednesday in North Lakhimpur. Banks and other financial institutions also remained closed during the bandh here.